With USB ports popping up everywhere you look, you need a simple and reliable way to store and share your photos, videos and music on the fly. The Cruzer USB Flash Drive is your answer. Because it works with virtually any computer or electronic device with a USB slot, this flash drive lets you leave your laptop at home but still take your vast amounts of content with you to share with family and friends. And to make sure all your important files are protected, SanDisk offers the free SecureAccess software download, which adds a private, password-protected folder to your drive. Whether you need to transport your latest MP3 downloads, vacation videos, or your college thesis, the Cruzer USB Flash Drive offers secure, portable storage that you can trust. Innovative capless design exposes the USB connector via a convenient slider. The Cruzer USB Flash Drive is a fast and reliable flash storage device for Windows XP, Windows Vista, Mac OS 10+ and Linux machines. With USB ports on computers, to new ports popping up on cars, DVD players, TVs, photo frames, and more, the need for a fast and reliable way to share your digital content on a moment’s notice is greater than ever. The Cruzer USB Flash Drive meets that need. This reliable flash drive fits in the palm of your hand and gives you the storage capacity you need to store and transfer up to 8 GB of data. While the drive is optimized for laptops and devices with USB 2.0 port, it is backwards compatible with older devices that have USB 1.1 ports, so you can be assured of near universal compatibility. With the Cruzer USB Flash Drive, you can transfer your favorite video from one device to another easily and conveniently, without any additional software or setup. The drive offers drag-and-drop convenience, which means you can simply drag the files from your device onto your Cruzer Flash drive, or vice versa, without any steps. Transferring video files from computer to computer, or from your drive to a USB-enabled DVD player, is incredibly simple. 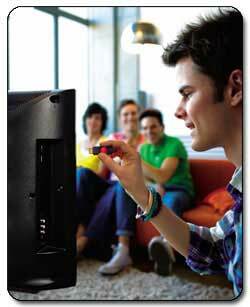 Drag your video files from your PC to your USB flash drive and then plug the drive into your DVD player – or even your USB-enabled TV – and sit back to enjoy the show. With a capless design that exposes the USB connector via a convenient slider, the Cruzer USB Flash Drive looks just as great as it performs. When you plug the Cruzer USB Flash Drive into your USB-enabled device, a glowing, amber-colored LED alerts you that the drives are ready for reading or writing data. This LED rapidly pulses when data is being transferred, and it slows down when the drives are idle, giving you a clear indication of the disk’s activity. The Cruzer USB Flash Drive is compatible as a flash storage device with Windows XP, Windows Vista, Mac OS 10+ and Linux machines. 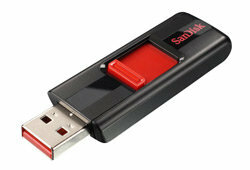 SanDisk Corporation is a Silicon Valley-based S&P 500 and Fortune 500 company. It is a global leader in flash memory cards–from research, manufacturing, and product design to consumer branding and retail distribution. SanDisk holds more than 1,700 U.S. patents and more than 1,100 foreign patents. SanDisk is the inventor of the SD, microSD, and CompactFlash card formats, and is the only company that has a license to manufacture virtually all major memory card formats. SanDisk’s product portfolio includes flash memory cards for mobile phones; digital cameras and camcorders; digital audio/video players; USB flash drives; embedded memory for mobile devices; and solid-state drives for computers. Cruzer USB Flash Drive (8 GB), 2-pack. 4 Registration required. Terms and conditions apply.